In a pinnacle event for Yamaha's Disklavier-based Remote Lesson technology, Maestro Byron Janis has conducted a long distance masterclass from Yamaha Artist Services in New York City, with students of the Moscow Conservatory. The event took place Sep. 28, 2016. University of Hartford's The Hartt School has selected a Yamaha Disklavier CFX concert grand piano (DCFX) for its soon to be renovated Millard Auditorium. 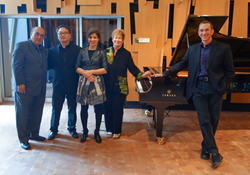 The award-winning reproducing piano will be permanently housed at Millard, one of the university's primary concert venues, to amplify student learning via master classes and distance learning. University of California, Los Angeles (UCLA) has purchased a new Yamaha Disklavier CFX concert grand piano (DCFX) for its Herb Alpert School of Music, designated this past January as the university's twelfth professional school and the first school of music in the University of California system. The instrument was specially selected by Yamaha Artist Inna Faliks, who also serves as professor of piano and head of piano at UCLA. This past June, Samford University's Piano and Chamber Music Institutie (PACMI) offered its students a first--the opportunity to participate in a masterclass with one of the world's most in-demand piano teachers, Juilliard's Professor Julian Martin.